Ferrets Unlimited Rescue Services and Healing Hearts Ferret Rescue are teaming up to promote ferret rescue and adoption in northern Ohio! Plan to join us for a day of food, fun, games, and activities featuring several of our furry (and adoptable!) friends. Time: 1:00 to 7:00 p.m. Donations of cash, food, or supplies are welcomed. RSVP: Not required, but it would help to know if you plan to attend, so that we can be sure to have enough refreshments on hand. For Info: FURS (216) 502-2977, events@ferretsunlimited.org; or Healing Hearts Ferret Rescue, (330) 931-9531, or ferretfreakx4@yahoo.com. · Fabulous raffles, highlighted by our always-popular lottery frame, a 50/50 raffle, and a pair of great tickets to an upcoming Cleveland Browns game. Raffle drawings will begin at 5:00 p.m. You need not be present to win. · A wonderful selection of ferret-themed items for sale to raise funds for our respective rescues. · Games, games, games! Litter Box Roulette, tube races, the great paper bag escape contest, and Ferret Black Jack. Pick one of our ferrets and cheer on the fuzzy whom you think will take top honors! · Bring a picture of your own fuzzy(ies) to post on our Brag Board! Come early and spend the day with us, or drop by anytime and join in the fun. We’re hoping for great early fall weather, so that we can enjoy both indoor and outdoor socializing. We’ll provide the main fare (pizza, hot dogs, maybe wings and burgers) and soft drinks. Feel free to bring a side dish, snack, or dessert to share. If you wish to partake in a more potent beverage, you may bring your own. Considering a ferret as a pet? Ferrets are wonderful companion animals – active, inquisitive, and very social. But, they have unique needs and habits and are not for everyone. If you are wondering about the rewards and responsibilities of sharing your home with a ferret, this is a wonderful opportunity to learn about them. The volunteer staff of FURS and Healing Hearts will be on hand to answer your questions and give you an in-person introduction to several of our adoptable ferrets. Please note: We do not adopt ferrets “on-site.” Potential adopters are required to complete an adoption agreement and agree to our screening process. We do this both for the benefit of our ferrets and potential adopters. Ferrets Unlimited Rescue Services and Healing Hearts Ferret Rescue are both 501(c)(3) non-profit charitable organizations. Your donations are tax deductible to the extent permitted by IRS regulations. It is never easy losing one of our kids, but we are especially heartbroken to write that our little Sampson has gone to the Rainbow Bridge. FURS' "Goodwill Ambassador" since he came to us last September, Sammie passed away quietly in the arms of Crystal Walko, our intake coordinator and 24/7 "ferret mom," during the early hours of Monday, August 8. Sampson was surrendered to us in the fall of 2010, skinny and hairless, except for a small amount of hair on his head and tail. His owner, who was moving out of state, wrote on his surrender form that Sampson (whose age he estimated at 6) was very sick, lethargic, and "wobbly on his legs." He had gone so far as to get into the car to take Sammie to be euthanized, but could not bring himself to do so. Crystal literally brought Sampson back to life with non-stop nursing, a vastly improved diet, and an unending supply of love and kisses. She documented his condition upon arrival at FURS and continued to post pix and comments on Facebook during the months he continued to improve and, ultimately, thrive. 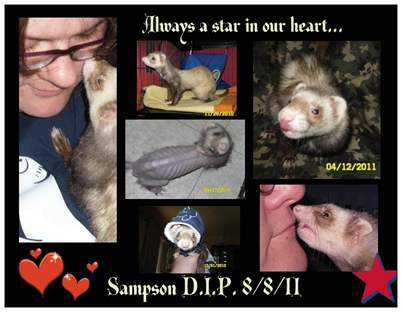 His tenacious grip on life and sheer personality catapulted Sampson to celebrity; he ultimately launched his own Facebook page and line of quality ferret bedding (Sampson's Cozy Corner, hand-made by our own Dona Clashman). Sampson began to fade last week and made his final appearance at FURS' tent at the Tractor Supply Company (Macedonia) pet/rescue event on Saturday, August 6. It was hot that day, but Crystal made the decision that Sammie required constant attention, and she fed him his duck soup and nursed him around the clock until he passed. He was brave to the end, when he let us know it was time for him to go. We will never, ever forget the little ferret would could -- and did -- steal our hearts with his personality and love for life. He was living, loving proof that what we do every day for these little ones is very necessary. And, that every ferret that comes to us, regardless of their condition, temperament, and circumstances, deserves the chance to live and thrive as Sampson did in the months that he was with us. Our lives are a little less bright today, but the heavens have one more star. We will always love and miss you, Sampson. You gave us hope, and love, humor and grace. You made us smile and often laugh out loud at your antics. You welcomed new ferrets into the fold and taught every ‘hooman’ you met the joys of ferretdom.